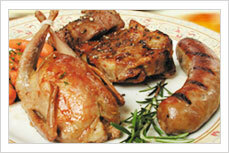 Our game birds and other game meat products are raised outdoors in free-range environments. This insures firm texture, as well as lots of flavor and nutritional attributes. 304 Semiboneless Quail 14oz. Package 9.99 ea. 323 Fat Tire Beer Brat 12 oz. pkg. 6.50 ea.